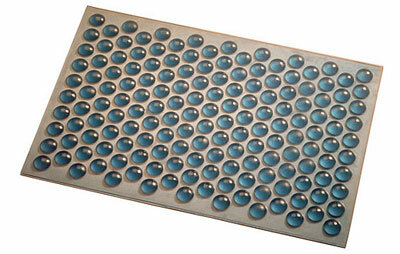 You are viewing Still Searching for the Perfect Bathmat which is posted in the product category. I would love to buy this bathmat by Dutch designer, Hella Jongerius. Browsing her site for textiles, I unexpectedly came across a photo of the Bathroommat and proclaimed it perfect. It is stylish, simple and appears to allow wet feet to grip the surface, although unfortunately it is no longer for sale. A disappointing Google search told me that it was designed in 1993 and now rests in the collection of the Centraal Museum in Utrecht, Netherlands. This product is everything I've been searching for in a bathmat, but cannot find amongst the shelves of flower- and starfish-patterned mats at familiar American retailers like Target and Bed, Bath & Beyond. The Bathroommat's blue dots hide suction cup scum (always a good idea -- camouflaged scum allows for a more flexible cleaning schedule) and the symmetrical pattern of dots would be calming to early-morning eyes. Currently, the mat I have is freakishly long. In an effort to find one that was free of useless embellishments I choose a clear mat that only came in one size -- XLong. The Bathroommat looks like it would be perfect for my two size 6 feet. I'm pretty happy with my bathmat. It's just a plain off-white large-looped-fabric one. I like it when I step on it for the first time after it has dried out in the sun and gotten sort of "crunchy." I think that feels good on the feet. Wet feet straight onto a wet tile floor is not pleasant. agreed. wet feet on tile floor = danger! my favorite time to step on the mat is when it's fresh out of the dryer. heaven... unfortunately that only happens about once every 2-3 months at our house. correct me if i'm wrong but the mat of which you speak is of the in-tub variety. it's the kind that old ladies and children use to prevent slippage on wet enamel. and if my assumption is correct, i agree they all look a little too clinical. i have a mildly severe phobia of falling in the shower and so a little extra slip protection is welcomed. why do they all have to look like your either stole them from a hospital or holiday inn? god bless the dutch for improving the banal.